With a slew of positive iTunes reviews and a couple of pre-release awards under its belt, I was expecting Frogmind's Badland to be a transcendent mobile gaming experience. I was greatly disappointed, at least for the first 20 minutes. 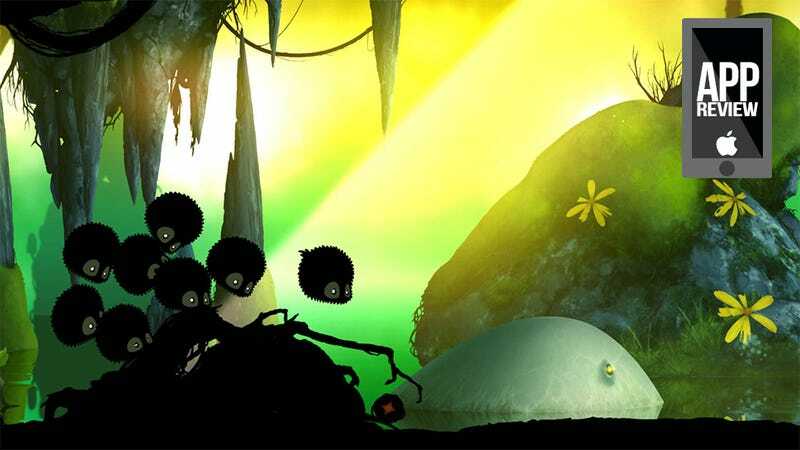 If you had asked me for an honest assessment of Badland during those early moments, I would have told you it was a simplistic side-scrolling platformer that mainly scored points for its sound design and Limbo-esque silhouette graphics. Gameplay-wise there wasn't much there — just holding your finger on the screen to make your odd little creature float, release to drop. I'd seen it before. Maybe not as pretty and polished, but I'd seen it. although many say this is a "must have" game, its nothing all that special and definately isnt worth 4 dollars. sad i spent so much on a game like this. not saying its bad buts its really nothing great. i didnt know what it was so i bought it, seeing everyones good reviews. but all you do is fly through and try not to be slow so that the screen catches up with you. i expected more. my mistake. But then I looked saw the ratio of good to bad reviews, and I knew I had to press on. Badland begins with little explanation of what's going on, and then takes its sweet time getting to the good stuff. The first dozen or so levels (the game launched with 40) are a slow-paced introduction to game mechanics. One floating creature becomes more as wall-clinging compatriots join the cause. Power-ups shrink, grow, speed up and slow down the player's party. By the time I reached the game's 15th level I was having a complete blast. Those hordes of creatures that join you on your quest to figure out what's wrong in the forest aren't true friends at all — they exist to be sacrificed. If they make it to the end of the level that's fine, but more likely they'll be guided down a dead-end pathway to activate a switch before the side-scrolling screen wipes them from existence. Eventually Badland transforms into a game that's a little more real-time strategy than it is platformer. Obstacles evolve from mere distractions to devious death traps that require real planning to overcome. It's just a matter of powering through those boring early bits. As an alternative, players can bypass the slow start entirely and jump right into one of the most entertaining single-screen local multiplayer games in iTunes. Up to four players guide their darkened balls to the end of specially-designed multiplayer levels, with bumping, flicking, tickling and other methods of distraction the order of the day. The most points win, but really everybody wins. Ultimately Badland earns every positive iTunes review and both of those pre-release awards. It takes a little patience (or a lot of friends), but there's a good chance it'll earn your affection as well, should you let it.